Ten of the 13 legislators in the House of Assembly voted in favour of the Recovery Agency. The controversial Virgin Islands Recovery and Development Agency Act has passed. It passed in the House of Assembly on Tuesday evening (March 27) with a majority 10-2 vote. 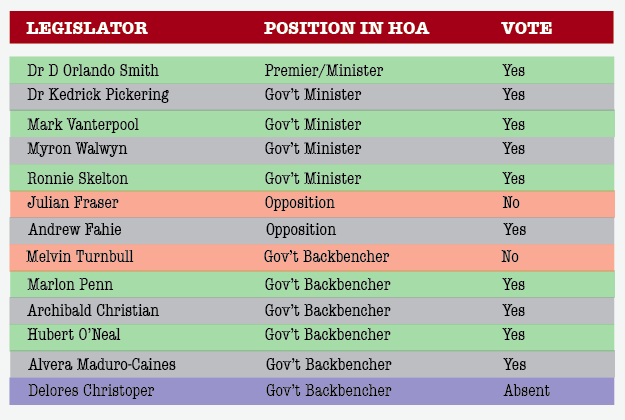 Opposition member Julian Fraser and government backbencher Melvin ‘Mitch’ Turnbull are the only two legislators that voted against the bill. Meanwhile, another government backbencher Delores Christopher was absent for the vote. Of the 13 legislators in the House, only Premier Dr D Orlando Smith, Mark Vanterpool, Dr Kedrick Pickering, Myron Walwyn, and government backbencher Dr Hubert O’Neal had initially declared their support for the bill. The other five backbenchers, one At-large government minister, and the two Opposition members had initially objected to the bill. They said they could not support the bill in its ‘current form’. Since then, Premier Smith said ‘amendments’ have been made to the bill. Those amendments were not specified but it appears the majority of who initially opposed the bill are now satisfied with the now-passed legislation. This means the Recovery Agency will be implemented and the BVI has accepted the United Kingdom’s loan guarantee of £300 million (more than $400 million United States currency). The Agency will have full control over how recovery funds are spent. All eyes on you now Gov. Apr 1 is fast approaching and we got things to do. Please do not waste time! I think the exact opposite will happen. Elections are next year and I have no intention of forgetting those who tried to derail this important legislation, nor how narcissistic and petty their approach was. I will neither forget nor forgive their shameless political greed when time comes to cast my vote. This is the way government should work. Speak your concerns have them addressed and move on. The concerns were in my opinion legitimate and they were addressed. My issue now is I don’t know why Mitch and Frazed opposed. I am scratching my head with these two. M—– couldn’t do otherwise because he doesn’t t— for himself. It’s no surprise Fraser did this because he neither likes F–e or the NDP so he has no issues standing on his own. Perhaps him and Mitch expected the others who signed their letter to vote with them. Those same members voted yes and one was conveniently absent. I would love to hear from Mitch and Fraser why they voted no and what they would do different in terms of trying to rebuild the BVI. District 7: Pastor C Fahie Picko will cut his tail..but barely. Dr. Karl Dawson win who doesn’t love Karl? Now we only need to get rid of M—- and all will become good again! It is a shame that even the Leader of the Opposition supported the bill and back bencher Mitch Turnbull voted against his own government whole the other one conveniently stayed away. I think ‘someone’ should resign. He has no respect for the Premier and in my opinion, he makes the government look bad to the public. Who are the members of the agency? I sincerely hope that it is not NDP choosing the members. If that is the case it will just be business as usual. Squander, waste, croonism, nepotism and wholesale corruption. Be that as it may, I pray our recovery goes well, and we once more will enjoy our paradise in the sunshine. It’s a sad day when politicians don’t stand for something. Thank you Mitch, Julian and Delores for holding your ground. The public never saw the proposed bill, neither the amended bill or the letter before the vote. I hope the U.K. rejects it and we have direct rule. I for one am not in favor of myself, my children or my grandchildren being saddled with a bill because the party I voted for (NDP) was so cavalier and free with OUR money. We forget they don’t run things. We are THEIR bosses, not the other way around. If they had taken the time to educate the public we would understand that it is NOT free. People out here chatting nonsense about they going to get help with their roof, their supplies etc. I wish you luck. I definitely know who I will NOT be voting for come next election. You are taking it personal. You rather have direct rule rather than borrowing. You are an idiot! Them 3 clowns who voted no just made my day. Now All you going get vote out just so. Doh! you are right, we should have spoken with all of those African nations that were lining up to help. Yes history shows that they were always there to support us.. I guess the pastor’s and their cabal have to eat crow! Great news. Now let everyone forget their differences and lets make BVI better than ever. Mr Premier, it’s time to fire M–!!! How much more disrespect and disloyalty will you take? I agree with this move but the Leadership is still weak and we need a change. If the ammendments were made and the main persons who opposed it voted in favor,I can’t see what is Mitch problem.It is time the he joins the opposition,if he is not happy with the way the NDP IS running.One good point from the debate is that persons have a right to express their opinion. this is the first day of our futures. towns we can be proud of, roads that will not endanger life and dentures, internet that is affordable and good enough to release opportunities, healthcare that is available and subject to competition, quality recreational areas and amenities to share and to make us happy to be there, a vibrant restaurant and hospitality scene. make it a place that really competes with the best of the rest. It was a messy road but we got there. for the Christophers, Turnbulls and Frasers of this world; let’s help them understand where they were so misguided, blinded by prejudice and paranoia, help them to understand the opportunities we can work for. It will be work – we are not out the woods. A better infrastructure move us from uncompetitive and unacceptable infrastructure to be in line with others. We need to look after our industries and all who work in them tirelessly to retain business here.If not, we won’t have a strong enough economy to benefit or to pay our debts. People of the BVI please tell me what is in the bill. What are the measures, stipulations, was a draft bill posted anywhere for the people to review as they do in every civilised country? 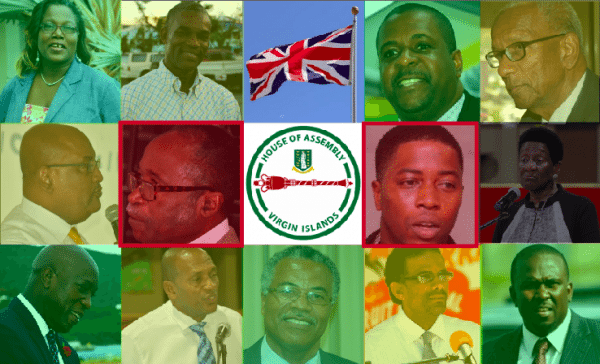 Why continue to blatantly disregard the people of the BVI, whose tax money paying these politicians salary, when the politicians have the BVI in the current state that it is in? Great if the uk is taking over the finances of whatever loans the BVI takes up because the p—- is too damn incompetent but why haven’t the people of the BVI been privy to the bill? So M– was crying…really? My a-s was crying too when the bloody government who I been paying my tax money to couldn’t even offer me a daily supply of dry bread and alkaline water after the hurricane. They wouldn’t go around and give people tarps for their roof. They went and jack up the prices in their own stores. Where were you when my a-s was crying? No God forbid if you dare have to live like a commoner, that’s the only reason some of these selfish politicians were crying. Their a-s want to secure their paycheck when so many people lost their jobs. So tell me, how is this a victory? Only Jesus can save us! 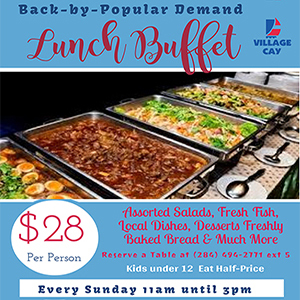 You can type from here to Tobago, the point is the BVI squandered its money over the past few decades and now we pay the piper. If we don’t want people in our affairs we need to act like adults. There is no reason why we shouldn’t have monies put aside which could have at least gone towards the priority areas. The fact that we had to wait a whole 6 months for Government to do anything meaningful shows how ill-prepared we are as a Territory. The lesson from this experience is that if we want to be taken seriously we need to get our house in order. If we had behaved like responsible adults we could have told UK, Branson and whoever else to keep their stinking money. But we can’t now can we? Because we don’t have a damn dime. At last we can begin to catch up with all the other countries affected by Irma that are now way ahead in their recovery than us. I think the ministers that opposed this should do the honourable thing and resign including those that suddenly couldn’t attend! Before they are sacked…. THIS YOUNG ROOKIE —- HAS BEEN VERY DISRESPECTFUL. NOT SURE WHO’S ADVISING HIM. BUT HE NEEDS TO KNOW HIS PLACE… HUMBLE YOURSELF YOUTHMAN!!! 3. Education and imposition of a fee. 4. Increased taxes on monies leaving the territory and other financial reforms. 5. Reform of the DMV, particularly its service to the public, its hours and its human efficiency. 6. Public works management reform from top to bottom with effective, knowledgeable get things done and right personnel. 7. Cut back on unnecessary governmental financial perks and privileges. I cant find my goods. D——— is a d——. She should be fired immediately. I could understand her voting against but just not turning up is a dereliction of her duties for which she was elected and for which she is well remunerated. I am not sure why they voted no once the docs were provided and amendments were made…I trust they have good reason we haven’t heard of yet. This was a good debate for us as a people and the current admin to learn that we are not foolish sheep who you know more than and can do what they want. Well well, let the games and over spending begin. It will first start with contracts being signed, but no bidding process, then it will be same contractors getting multiple jobs, then it will be contracts being signed for overpriced budgets…. Let the games begins, and cookie crumbs to fall where ever. Under the terms and conditions: A well structured recovery plan needs to be implemented. Government needs to put that money to use. Hopefully another tax format isn’t implemented for citizens and residents to pay back this money. It seems you read what you want. It clearly stated that interest rates would be cut by more than half and years to repay extended, meaning we will be paying less on our debt than we are paying now and getting access to more cash to rebuild. We just need to keep our eye on everything and keep them on their toes. I Dont understand you people .. Mitch was trying to protect the island from loans that will be misused.